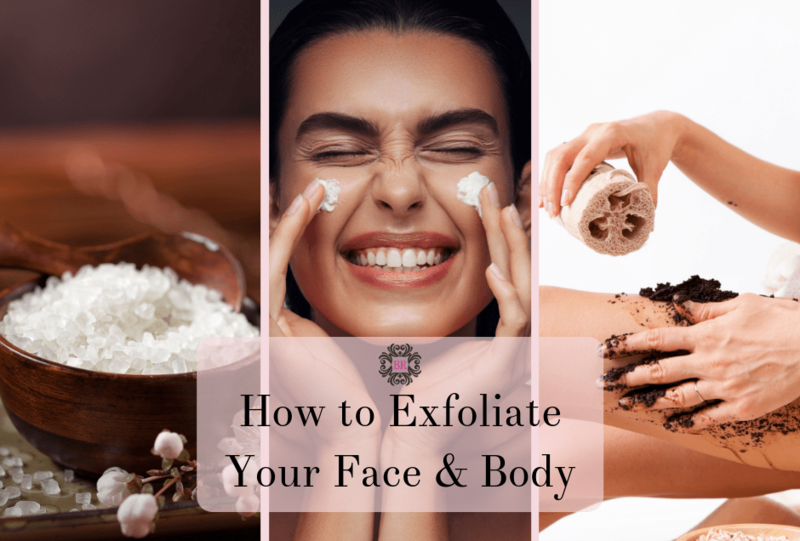 You’ve probably heard that you should exfoliate, but learning how and why will explain why it’s so good for you! Taking good care of your skin means that you can add years of “looking younger”. don’t forget your body! Another bonus is that every skin type and skin condition should exfoliate for healthy skin. Because every 28-45 days skin cells die and compact on the top of our skin. 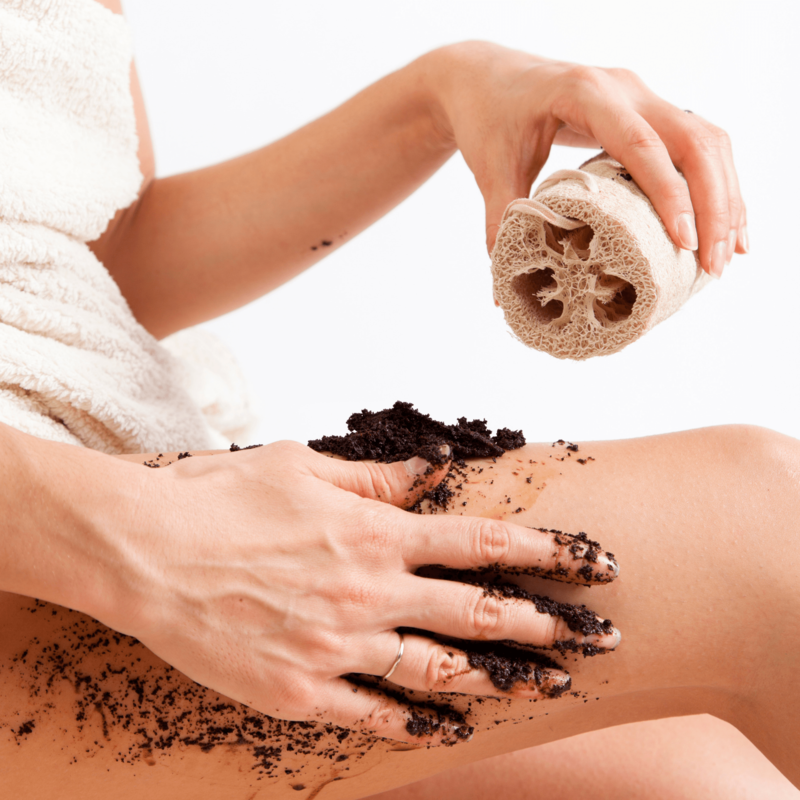 Exfoliation removes the dead cells, allowing the pores to absorb nutrients. The process will refine the top layers of skin, making pores appear smaller. Another added treat is that it increases the oxygen and circulation in the skin. This gives the skin a healthy, radiant glow. The bonus to treating your skin well is that healthy skin will perform better. By removing the dead layers that are compacted on top of the skin, you essentially allow the skin to “breathe” better. This process will also make your serums and moisturizers last longer (because you are not applying to dead, flaky skin, which does not absorb). Exfoliants can come in 3 forms – Chemical, Physical or a Combination. ✨A chemical exfoliant is like glycolic or lactic acid. Other chemical exfoliants include enzymes. In spa facials, we love using enzyme peels like passionfruit, coconut papaya or pumpkin glycolic. ✨Enzymes exfoliate (chemical) by working to eat the dead skin and there are numerous types. Enzyme types may include papaya, bromelain, malic, blueberry or pumpkin. Enzymes are typically from fruit extracts. ✨Physical exfoliants are scrubs from pumice, walnut shells, sand, man-made beads (not eco-friendly) or salt. Scrubs that are not from natural ingredients can scratch the skin causing tears. A great example of a combination scrub is the Raspberry scrub from SkinScriptRx. This has ellagic acid, jojoba beads and blue corn meal to provide mild physical exfoliation. The formula mixes chemical and physical exfoliation. strip the oil off the face. This means that the face will be drier, flakier and sometimes even hurt. Drier skins respond very well to chemical and enzyme exfoliators (those with alpha hydroxy acids). After exfoliation, dry skin needs oil and lipids to nourish the new cells. Very popular are the Sphingolipids in Flawless Drops to be used right after exfoliation. Oily skins love exfoliation as long as the scrub can cut through the oil Chemical and physcial scrubs are great for oily skins. Oilier skins tend to love a scrub that is clay based like Environ’s clay masque, or a chemical exfoliant. Busting a Myth: Benzoyl peroxide while touted as fabulous for oily and acne skins is not an exfoliant. It is an anti-bacterial agent. Great for acne skins in very low, highly buffered amounts, benzoyl peroxide as an exfoliant will only strip oil skin. Skins that are normal can use just about any scrub or chemical exfoliate. Just be sure that you do not over dry or strip off the natural oils. Exfoliation for normal skins can be every other day or 3 times a week. When skin is combination, it is a little tougher to know which products to use and how often. Concentrate on exfoliating the places that are dull, flaky and uneven. The difference between dehydrated and dry skin is the difference between oil and water. Dehydrated skin is lacking in water and needs an exfoliant that is not drying to the skin. The microdermabrasion scrub from Biodroga works wonders on dehydrated skin. Acne skins should stay away from scrubs if there are cysts, pustules or papules. Scrubbing with active acne can spread the bacteria. If the acne is beneath the skin, then using a physical scrub is fine. Chemical versions for acne are made with salicylic acid or glycolic. Dual exfoliants work extremely well for acneic skins. 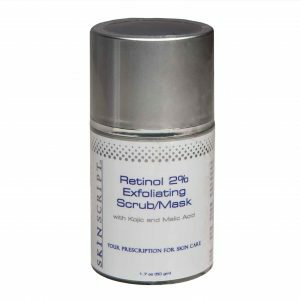 The Retinol Scrub Mask from SkinScript Rx or the Glycolic Retinol Pads keep acne skins healthy and bacteria free. See the Busting a Myth above for Benzoyl Peroxide in an exfoliant. Recent studies have allowed rosacea clients to use a very, very mild scrub (sand or extra fine salt) that allows the skin to shed the top layers. For best results, rosacea skin needs to shed off that top layer of dryness weekly. If the skin is sensitive, you should stick with very fine scrubs and light chemical peels. Bamboo sand natural exfoliating face scrubs like our Micro-Polish work well with sensitive skin. Skin ravaged by the sun can seemingly tolerate an exfoliate that is tougher on the skin. We advise you to be very careful. Sun damaged skin usually is thinner and has capillaries close to the surface. Be careful not to rub too hard so that the fragile capillaries don’t break. Either night or day is easy to exfoliate. Our suggestion is in the morning. Apply to your face before brushing teeth. Brush teeth and leave on. Jump in shower and the scrub has time to do “double-duty” as a mask. If you use a retinol at night, you may want to exfoliate before applying. The retinol will work better. But do know that the retinol is your chemical exfoliant. Two to three times a week or daily depending on your skin type and skin conditions. For most, it will be 3 times a week. If you see that your skin becomes red or feels too dry, reduce the number of times per week. ✅ Caution Warning: If you are using an enzyme or new type of exfoliant, apply a small amount at first to test for an allergic reaction. There is always the possibility that you could have sensitivities even to things like walnut shells. ✅ Scrub: Use a little warm water on the skin and mix with the scrub. Gently make circular motions over the face in upward motion. Let sit if you have time (like a mask) and rinse off. ✅ Enzyme: Apply the enzyme and let set for 10 seconds on the skin. Massage into the skin until the enzyme starts to become a little tacky. Let sit for 7-10 minutes and rinse. ✅ Chemical: Apply alpha hydroxy acid to the skin and let sit on skin. You can feel tingling or little pins. Remove after 3 minutes. ✅ After Exfoliation: After removal, apply a serum for your skin type and then a moisturizer. A serum is more concentrated and the ingredients will readily absorb into the skin. The cream moisturizer will then lock in the serums to the skin. ✅ Cleanser or No Cleanser: If you are exfoliating in the morning, you will have hopefully cleansed your face at night. Therefore in the morning, you will not need to cleanse before the scrub. At night, you will want to cleanse before you exfoliate. ✅ Brush or No Brush: Our team of estheticians is quite unanimous in the vote for No Brush (circulating or not). The brushes can no only cause over-exfoliation, but they can harbor bacteria which is simply spreading when used. ✅ Sunscreen in the AM: Lastly, always apply an SPF of 30 or higher. It’s the secret to beautiful, flawless skin. Softer skin from head to toe is simply divine. Building exfoliation into your daily routine will give you healthy skin for life. How often to body exfoliate? Yes, body exfoliation should be a daily exercise. Exfoliating gloves (our fav), a loofah (too harsh) or a dry brush (be careful) will all help to take off excess dead skin. Prior to a shower or a bath rub in circulation motions on arms, legs, stomach and dry patch areas like ankles, elbows and knees. Use a dry brush with a handle for your back. If your skin is too sensitive, lightly dampen the skin and then use the gloves in circular motion. Let water run over the skin to remove excess skin. Just like face exfoliating cleansers, there are products for the body. Body scrubs and exfoliating body washes are a great addition to your daily routine. Remember to use your circulation motions. One of the best products we know comes from a South African company called Environ. You must pop into the spa to purchase as the products require a consultation first. The product is Derma-Lac Lotion. With lactic acid in the base, this product exfoliates deeply after using the dry brush gloves. 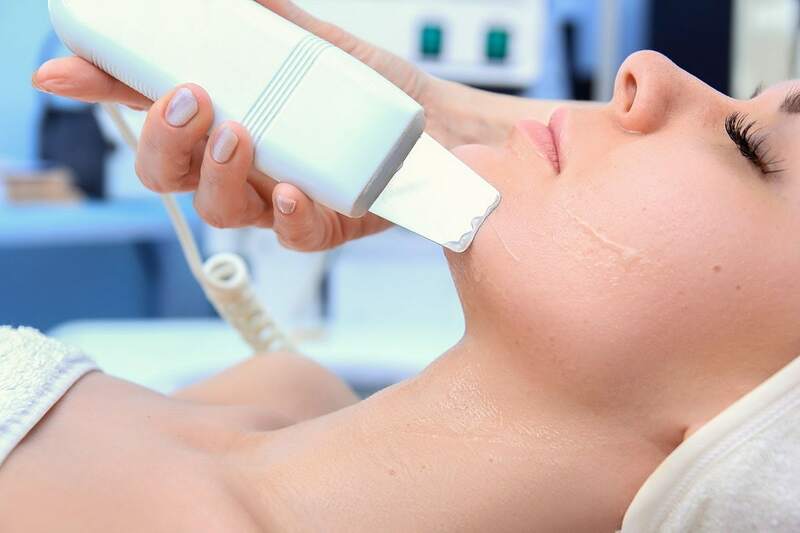 Professional exfoliation treatments found in the spa or skin clinic include microdermabrasion, dermaplaning, enzyme peels, acid peels and scrubs. While exfoliation should be done weekly and or daily, the health of your skin can greatly benefit from professional skin treatments. For years microdermabrasion has been popular from the aluminum oxide crystals to the more modern ultrasonic version. 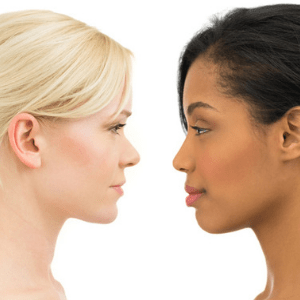 There are pros and cons to microdermbrasion, but it remains a popular choice for glowing skin. The up and coming treatment, dermaplaning uses a surgical blade to gently exfoliate the surface layers of the skin. While popular alone, the treatment works extremely well with penetration techniques like the Rezenerate. The new skin benefits from the infusion of serums and peptides. Fruit enzymes have been exfoliating skin since ancient civilizations. The use of passionfruit, blueberry, papaya, or any type of fruit can pinpoint target skin conditions. This type of exfoliation signals the skin to react in a certain manner. 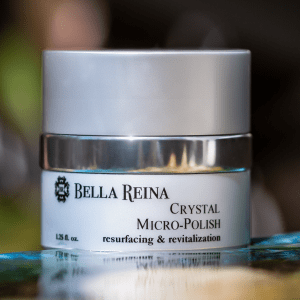 Enzymes are commonly used in facials at Bella Reina to increase the skin cell’s health. Chemical peels have also been popular for years with goat’s milk (lactic acid) being even mentioned during Cleopatra’s days. An assortment of acid peels can be used professionally including lactic, glycolic, TCA, malic salicylic and numerous others. Scrubs focus on purely physical exfoliation and the power of the scrub depends on external factors. The type of beads or exfoliant (sand) determines how the skin is refreshed. Another factor to consider is whether the hands are used or if a brush is used to basically “sand” the skin. No matter the type of professional exfoliation, too much exfoliation is not good for the health of the skin. Additionally, it’s important to “feed” the new skin nutrients, lipids and peptides so that it glows luminous.